What happens when an accomplished and prolific theologian, who has not previously given extensive attention to the doctrine of the Holy Spirit, produces a substantive book on that doctrine? 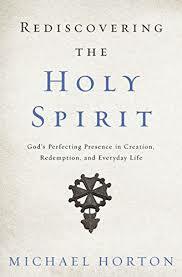 This was the situation when Michael Horton published Rediscovering the Holy Spirit. In short, what happens is not revolutionary and is not radical. It does not expose a weakness in his previous work. Horton does not repent or convert, as if he had previously been guilty of some Spirit neglect. He does not pitch the book as the testimony of one who once was blind and now can see, and is inviting others to a like conversion. This volume is not an about face or a reversal; it is simply, and calmly, a step back. This is what we would expect if we already thought his previous theology was solid. Unless Horton had been diagnosably operating with a pneumatological deficit all these years, we would expect that when he gives sustained attention to the doctrine of the Holy Spirit he would continue developing that same theology but now from a different angle or from a broader perspective. Pneumatology provides him not with a new message, but with a new view of the same single subject of Christian theology. It seems to me that Horton’s approach to pneumatology can be a helpful case study to open up an issue crucial for all Christian theologians. A couple of important themes take on new prominence as a result of Horton’s step back into pneumatology. We can bring in the Spirit too late in the story. One of my central concerns in these chapters is to explore the Spirit’s distinctive role in every external work of the Godhead. The Spirit is neither “shy” nor a freelance operator; his work is not merely supplemental to the creating and redeeming work of the Father in the Son but is integral to the divine drama from beginning to end. In short, I want to widen our vision of the Spirit’s work. If there is any note of revisionism in Horton’s account of Reformed theology, it might be here. One of the main structural moves in Reformed theology is to correlate the work of the Holy Spirit with the application of redemption. Roughly stated, the Son accomplishes redemption and the Spirit applies it. This venerable schema has very old roots in Reformed thought, and has achieved a certain prominence in some classic twentieth-century authors, from the popular writings of John Murray and Sinclair Ferguson to the dogmatic work of Bavinck and Barth. Horton does not repudiate that schema, but he is careful to keep it from overdetermining his pneumatology. He warns that “Introducing the Holy Spirit too late in the story—at the application of redemption—we miss much of the action.” His step back involves securing the Spirit’s person, presence, and work earlier and more pervasively than the application of redemption. In particular, when he takes up the difficult question of what is new in the Spirit’s work since Pentecost, he says that “The two main coordinates… are covenant and eschatology.” –a very predictable Horton thing to say, of course, and I mean that as a compliment. I believe that I cannot by my own reason or strength believe in Jesus Christ, my Lord, or come to Him; but the Holy Ghost has called me by the Gospel, enlightened me with His gifts, sanctified and kept me in the true faith. There is the work of the Spirit, inseparably operating with the work of Christ.